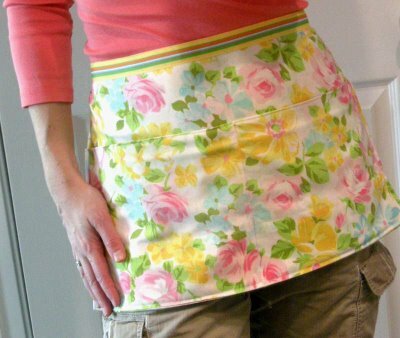 If you have a spare ten minutes and a pillowcase, you can create a pretty half-apron for the kitchen. Just follow this tutorial from Betz White. 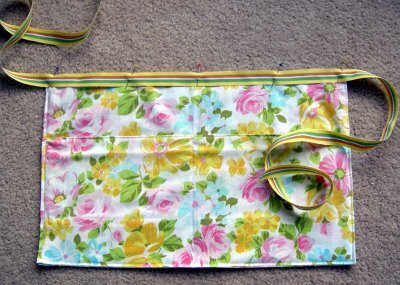 Pick up a pillowcase at the thrift store with a floral pattern, find some coordinating ribbon, and you are all set. Find this sewing tutorial and 18 other Mother's Day crafts in the Mother's Day Crafts: Blogger Edition 2010 eBook. 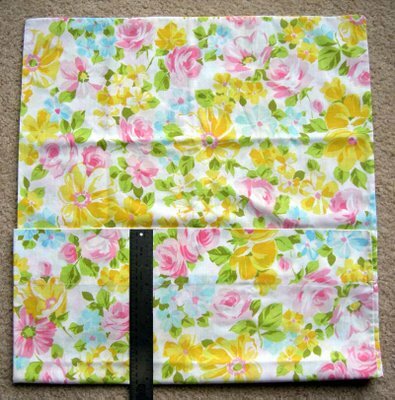 Lay about 60" of 1" wide ribbon across the top edge of the apron centering it on the length of the ribbon. Pin in place. Topstitch ribbon at the top edge, bottom edge and across ribbon at sides of apron. We interviewed Betz White on FaveCrafts Radio and asked her about this project. Listen to the May 4 show to hear her tips and tricks. 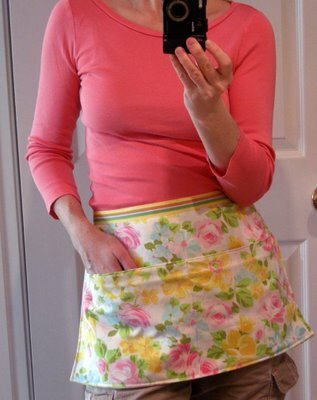 This apron looks cute, and more important, its easy to make! 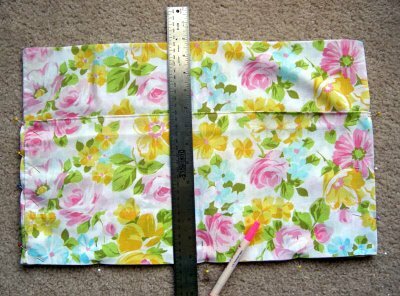 I know I will make a bunch of these aprons, for my little students. They can use an apron while painting. But I think I will add one more pillow case and sew it somehow for covering the chest area. Thanks for the idea! I see so many pillowcases at yard sales or thrift stores or even clearance bins that are so cheap but they do not match my bedroom dcor so I pass them up but now I know that I can use them for aprons. You can never have enough. Aprons are not just for in the kitchen but can be worn for painting or crafting to keep your clothes clean. I love the big wide pocket in the front to hold things. They can be made for kids or adults. So super fast and easy using a pillowcase and ribbon. Lets make some. I love this craft, because you can do it so many different ways. If you want to do this project with younger children, you can use fabric glue instead of using a sewing machine. If you have a group of children that are ready to learn on a sewing machine, this is a perfect beginners project for all ages. I never thought of using a pillowcase, this is such an awesome idea. Thank you so much for sharing! Wow! Now that is clever! Especially when you end up with one extra non-matching pillowcase you don't know what to with! I will do this one, very good idea! Thanks! Great idea! Pretty and practical. I just love all the projects. I usually don't comment, but this pattern deserves a comment. EASY, CUTE, FUNctional, QUICK, I LOVE IT! 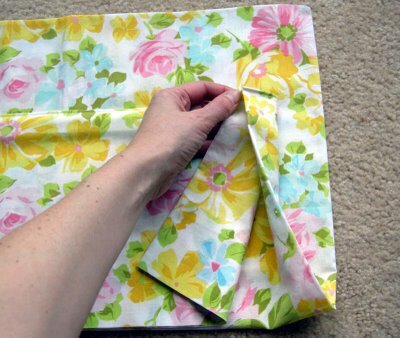 Nice and easy and quick and a good way to recycle pillowcases. This is so cute,easy and practical. I am beginning to teach my daughter in law to sew and I think this will be the perfect project to begin on. Thank You for another fun idea. very easy and pretty. Now if I just had a sewing machine that worked. great easy and very pretty!